German Shepherds are the world's leading military, guard and police dog. They are one of the most recognizable and popular breeds of the AKC. 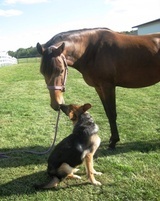 German shepherds are also a loving family friend and show competitor. These dogs are well muscled and alert, but also full of life. At the highest point on the shoulder males should stand 24 to 26 inches, while females should stand 22 to 24 inches. German Shepherds can be a variety of colors including black/tan, black/red, black, sable and bi-color. A white dog is a disqualification. They also come in a variety of coat lengths such as short hair and long hair. The gait of this dog is elastic and seems effortless. It should cover the maximum amount of ground with each step. Disqualifications of the German Shepherd include hanging or cropped ears, docked tails, dogs with a nose any color other than black and dogs white in color. Here at Wood Valley Farm and Kennel we offer dogs in the color varieties of black/red, black/tan, black and sable with most of our dogs being short haired. Our dogs have German lineage and are either AKC and/or SV registered. All puppies are exposed to daily neurological stimulation. They are temperament tested at 49 days old to evaluate their temperament and training potential.